Should You Get A Bathroom Heater? What Makes A Good Bathroom Heater? We understand full well that you are perhaps tired of walking into a cold bathroom early in the morning with eyes half-shut. 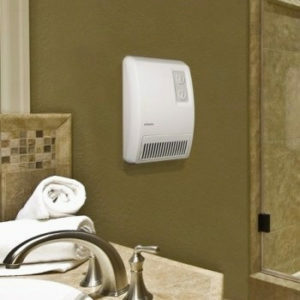 If you think it’s about time the frustration stopped, then you are likely trying to purchase the best bathroom heater. And what’s not to like about such an awesome device? Its job is to only provide you with pre-heated bathroom before you take your morning shower or after you finish it. No need to curse your life while shivering in an unfriendly, wet environment. Enjoy optimal temperatures at the push of a button. In this piece, we have compiled a comprehensive buying guide to getting the finest bathroom heater out there. We will give you pointer regarding efficiency, value as well as functionality and perks. Check out the research which we have done and see the bathroom heater reviews which we’ve prepared for you. DIMENSIONS : 10.3 x 12.8 x 8.2"
DIMENSIONS : 0.9 x 17.2 x 8.7"
DIMENSIONS : 4.5 x 9.5 x 8.3"
DIMENSIONS : 6 x 6 x 7"
DIMENSIONS : 5.1 x 10.9 x 15.8"
An exceptionally easy to use product is the Holmes Digital Bathroom Heater Fan. The brand is well-known when it comes to creating such useful gadgets and this model is no different. The speed at which this unit emits warmth is impressive and effective. Use the digital timer to pre-set any duration you wish and let the heater fan work its magic. You will be happy with the max output of the heater as it stands at 1500W. You can count on it to not be louder than your shower with its 60dB of noise. The special ALCI plug will prevent the machine from malfunctioning in a moisturized environment such as the bathroom. The thermostat is a key component allowing the heater to turn off after a certain temperature is reached. At the minimum setting, the unit will still keep the temperature above freezing. Safety is exactly what you need when we talk about heaters in the bathroom. 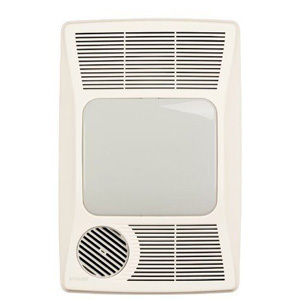 The Stelpro Design Bathroom Wall Heater gives you exactly that because it is a wall recessed appliance. This means that the whole thing will be built-in the wall and you will only operate the front panel. Hardwiring means that you do not need to plug anything on or off thus making the heater extra safe. The fan is one of the quietest ones that you will encounter even if you have the heater at the higher setting – 1500W. The lower setting will give you a power output of 750W. It is not the best option for a larger bathroom as it can cover only about 150 square feet. The heating element is a nickel-chrome one giving you fast heat but it also cools off rather quickly. Needs to be hardwired to a 120V circuit. 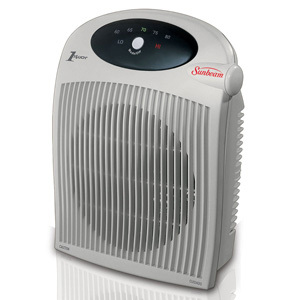 This Seabreeze ThermaFlo heater is a rather simplistic one and the price pretty much show it. However, the model has a number of advantages and we shouldn’t overlook it by any means. The ThermaFlo technology which is mentioned in the name will allow you to save about 33% electricity. This is quite an impressive feature by such a regular bathroom heater. The front panel has 2 dials by which you control your gadget. Choose a power regime between I and II. The lower one will provide you with 1000W of output and the higher setting’s output is 1500W. All of this is pretty standard. What’s cool, though, is the auto-turn off property which will shut down the heater in case it tips over or falls off. The body is made out of flame resistant polymer. The little light will prompt you or serve as a reminder of the operating mode which you’ve selected. This ceramic bathroom heater comes at a very budget-friendly price and truly has everything needed for a typical bathroom. The size is pretty compact but the amount of space it can cover with its heat is rather impressive – 225 square feet. This is a size normal for a living room and not a bathroom. 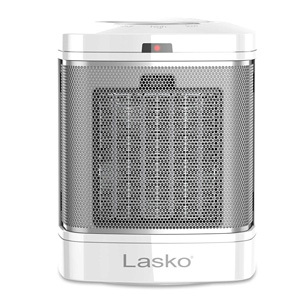 You will enjoy quick heating as the resistor of this Lasko model is of very high quality. The time needed for you to feel completely comfortable would be around 5-10 minutes. It does have 2 main settings- high and low but there is one extra setting which is particularly convenient. It is called “1 hour”. The name shows that the heater will function for 60 minutes and will then automatically shut off. This is one of the main reasons why this product is so popular. The little red light on top will let you know that the unit is fully operational. This unit is manufactured in Germany and that’s a sure sign of its quality. The design is rather clean and conservative with no extra fluff. What you have is just an on/off button on the side and a thermostat dial on top. 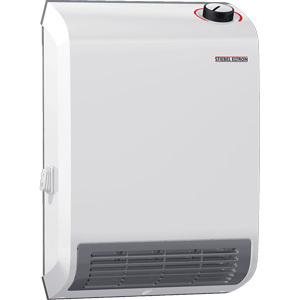 Since warm air quickly gets to the ceiling of the room, the Stiebel Eltron Fan Heater blows it downwards and it is recommended that you mount the device about 2-3 feet off the ground. If your bathroom is larger than 200 square feet, then this unit shouldn’t be used as a primary heating option there. The manufacturer offers you a variety of models depending on wattage (1500W or 2000W at maximum) as well as the voltage of the circuit – 120V or 240V. On the downside, there’s no fan-only setting although there is a Frost protection setting allowing you to have a temperature between 7 and 35 degrees. DIMENSIONS : 13 x 2 x 11"
DIMENSIONS : 18.3 x 6.9 x 13.6"
DIMENSIONS : 12.4 x 10.1 x 6.4"
DIMENSIONS : 5.2 x 14 x 9.5"
DIMENSIONS : 16 x 10.2 x 5.9"
This next bathroom heater will give you two versatile option when it comes to operation. The Phantom 4 Wall Panel Heater has a dual-heating method – radiant and convection. What this means is that you get heat not only from the front but also from the top of the product. Such composition ensures efficient heating. The power output isn’t the strongest – 400W. However, this is exceptionally convenient in case your bathroom isn’t very big. The whole item is made out of nature-friendly materials and doesn’t contain anything harmful such as asbestos or any sort of chemicals. In fact, the body is aluminum made which means that it heats quickly and keeps the area warm for longer. Don’t worry about short-circuiting as the Phantom 4 Wall Heater has double safety cut-out. Similar to other wall-mounted heaters on our list, this one also requires being built in the wall of your bathroom. Well, here is a model which won’t require any hole-drilling. Even though the Dimplex Deluxe Heater is meant to stay on the wall of the bathroom, it comes with an included frame. You need to attach the frame to the wall and that’s pretty much it. This fan-forced product comes with a maximum power output of 2000 watts. What this gives you is a lot of heat and pretty quickly too. 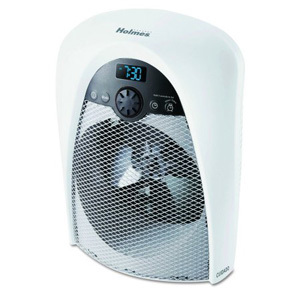 The fan will enhance the performance of the heater spreading those warm waves all over the room. Such a piece of equipment is exceptional for larger bathrooms. The downside of this whole thing is that it is not very budget-friendly. The energy expenditure is significant but you will definitely be satisfied with the performance. Additionally, you get a Frost-protection function. It will prevent your pipes from freezing during the winter. Be sure to note that it requires a 220V outlet. Finally, we get to review one of the digital bathroom heaters. It does have a fan but you shouldn’t expect it to be a noisy one. You have a number of power outputs but they do not go by wattage. What the user sees is a certain temperature similar to an AC. Your options vary from 60 to 80 degrees. Keep in mind that they go at intervals of 5 and you cannot select anything like 64 or 73 degrees for example. This is a minor drawback but it shouldn’t be a deal breaker at all. The thermostat will, of course, allow you to control the level of heat you wish. This doesn’t clash with the output settings at all, though. 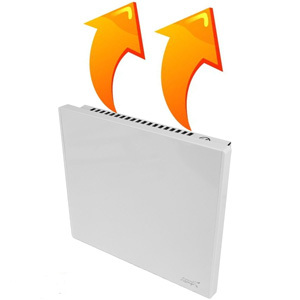 Thanks to the way the heater works, you can select quicker heating or long, continuous warmth. The ALCI plug is, of course, a must since this is not a wall-mounted bathroom heater. Have a rather large bathroom? No problem, the Cadet Com-Pak Heater will get rid of moisture and will allow you to heat the place up in no time. This product can cover an area of about 200 square feet which should be more than enough for the purposes of your bathroom. One of the best features is that upon purchase you decide on the voltage of the heater. Grab a 120V one or a 220V depending on your electrical system. 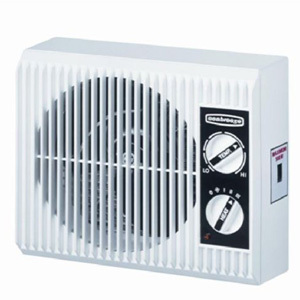 The Cadet heater also comes in a number of max output variants. You can save some money by going to the 1500W one. The most expensive but powerful option is the 4000W one. This is rarely the choice to make as it truly requires a large bathroom. One downside is that there isn’t really an “off” switch. You simply need to keep the thermostat at its lowest if you do not want any activity. Versatility is the name of the game when we talk about this Broan Bath Fan. You can opt to have it mounted either on the wall or the ceiling. The versatility which you get because of this characteristic is invaluable. The product has its max output at 1500W. It is easy to clean as it requires dusting maybe 2 times a year. There is a fluorescent light included which really adds to the atmosphere. Most users will be happy to find out that the hanger bars are actually included in the set. All you need to have is the wiring. If you are looking for something with a number of heat settings and a thermostat, then this isn’t your product. What you get here is a fan which will definitely allow you to keep the temperature in the bathroom above freezing. Additionally, it will eliminate moisture and will keep the room dry. Similar to many things in life, bathroom heaters are also a purchase which has its pros and cons. Our guide intends to not only help you select the best product for your needs but to also give you a bigger picture. This is why we will also outline some of the main reasons as to why you might want or not want to buy a bathroom heater in the first place. If you are in a desperate need to find a way how to heat a bathroom without central heating, then you are in the right place. These little machines will definitely provide you with an extra dose of convenience. Your family will love you more once they start walking into a pre-heated bathroom early in the morning. You basically get one more room with bearable temperature during the winter. 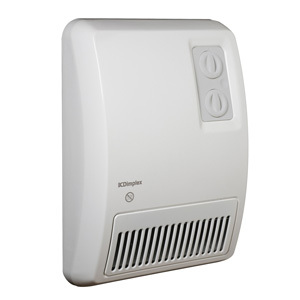 A bathroom heater is a light and compact device which will definitely make your life easier. The settings are easy to adjust and all of the products we reviewed above are exceptionally user-friendly. Having problems with moisture? No worries, a bathroom heater fan is exactly what you need to obtain. It will do just fine against damp walls and ceilings. An additional upside is that you can dry your laundry inside your bathroom in case you do not have a drier. If you leave your towel around the heater, it will be warm and nice once you are ready to go out of the shower. This completely eliminates the need to install heated towel rails. Well, in all fairness, this is a cheeky addition to any home. There’s a reason why people do not generally install any heating options in their bathrooms. That’s because you spend very little time there and when you need to get warm, you typically just run some hot water. That being said, a bathroom heater will set you back some money right off the bat because you need to purchase it. Then, your electricity bill will surely bulk up even though it shouldn’t be by much. Similar to all other electrical appliances, this one might also malfunction and require some repairs. All in all, that’s just one more thing to take care off during your day. You need to be absolutely sure that you need one of these before you buy it. In case the money aspect doesn’t bother you, then you can surely go for it. Bathroom heating solutions are not pointless by any means. On the contrary, the benefits are countless but if you have other domestic heating priorities, then set them straight first. Since we like to stay true to our word, we will point out exactly what to look for when you are choosing your bathroom heater. Some of these properties below are pretty important while others can 100% be ignored. Whatever the case, make sure you know exactly what might be good for your bathroom and then go from there. While some features are pretty standard for most cooling and heating domestic devices, some are rather specialized. We will go through all 3 of the types in an attempt to assist you in deciding which one might suit your needs the best. See their main differences and think which one fits the profile of your bathroom. These little fellas are very simple to use, simple to install, and simple to maintain. See a word that is constantly repeated there? They come in a fairly small size and more often than not resemble a box. Versatility is what you get with them as a typical portable heater can also be used outside of the bathroom. But what sets them apart from floor heaters. Well, these gadgets are designed to withstand temperature, fumes, and moisture. Their body is often constructed of specialized heat-resistant polyethylene. In other words, sturdy plastic. They can also be made out of aluminum although this holds the danger of one burning themselves as the material can get pretty heated. 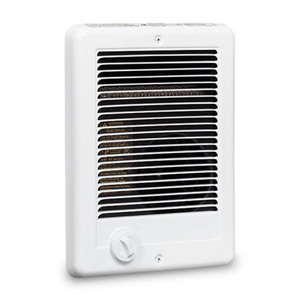 Another key feature of the best portable bathroom heater is the presence of the ALCI plug. It doesn’t allow for any water to penetrate the wire and thus cause significant trouble to the heater and the whole system. The ALCI plug is your insurance that water and electricity do not come in contact. It is just one of the obligatory things you need to have in your bathroom for safety reasons. In general, portable heaters are nice for small bathrooms and for people who might end up using the product outside of the bathroom as well. The first sub-type requires a hole in the wall or the ceiling. 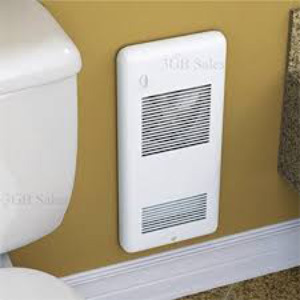 These heaters are typically preferred when a bathroom is under construction or complete renovation. It is pretty inconvenient to have a hole carved up in your ceiling when your bathroom is fully operational and polished. A big upside of this sort of wall heaters is that no wiring will be visible. Since they are fully mounted inside the wall, their power cord system is completely hidden as it is directly connected to the electrical network. You have the option of connecting your heater with the light switch to have it automatically running when you turn on the lights. Other wall heaters just have an “on/off” button on the panel. The second sub-type is not as pretentious when it comes to installation. Usually, a metal frame comes with the heater itself. Anyone can deal with attaching the frame to the wall and then put the heater on it. This product, however, does not feature the cleanest design as it doesn’t get snugged nicely into the wall. It is sort of obvious that it isn’t part of the whole bathroom landscape but was brought in afterward. Another disadvantage is the obvious wires and cords that you simply cannot hide. They will likely hang from the body of the heater and will go all the way down the wall until an outlet is reached. 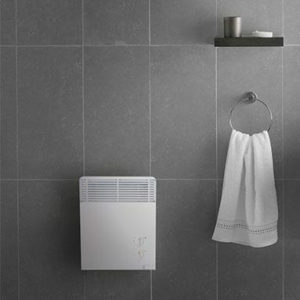 A drawback of the bathroom heater wall mounted regardless of the sub-type, is that it is completely immobile. You have zero maneuverability if you opt for such a device. Among some of the popular bathroom heating ideas, we can also point out installing just a fan. Now while it will not provide you with any heat, it will actually get you some air movement. And this is crucial for any bathroom. A Fan will not really affect your electrical bill as well. Its power output is minimal as there’s no heat resistor to talk about. 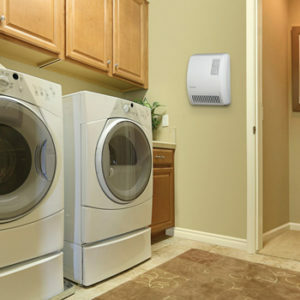 Drying clothes or dealing with unwanted moisture is the bread and butter of every bathroom fan. You can have it connected to the light switch so that you can have it blowing every time you turn on the lights. It won’t solve your heating problems, though. On the other hand, a typical floor heater will not provide you with any blowing effect. That being said, the best thing you can do is perhaps looking for a combination of both. High temperatures together with something that distributes heat to every corner of the bathroom is something everyone loves. You cannot browse for any sort of bathroom heating products and ideas without paying attention to the power output. Customization is key and a good bathroom heater should provide you with an array of options when it comes to selecting the right temperature. The usual maximum output of those heaters is between 1500W and 2000W. It is definitely not the most cost-effective property but you are looking for heat after all, right? In all fairness, there are those with a minimum output of about 400W. Such bathroom heaters while not very powerful are simply excellent for small bathrooms. There is one thing to think about, though. Smaller spaces typically feature very little, if any, “dry areas”. You cannot plug in the heater right next to the shower. You should have at least 2 feet of distance between where the water is flowing and the device. Some people hate dials while other avoid getting something with a display. Other heaters have buttons thanks to which you change the settings. There’s no doubt that it all comes down to preference as the way you input your settings is practically just cosmetics. Among the more popular heating functions, you always want to have a thermostat. No decent bathroom heater will come without one. This addition basically ensures that your heater will not blow up because of the temperature it has achieved. Second, you want to look for a device with a number of power output options. Some days aren’t as hot as others and you won’t need to have that thing cranked up to 2000W. Whether you press buttons or rotate dials it doesn’t matter. Electric bathroom heaters with timer are also quite the hit. The timer will not only turn off your heater but it can also be programmed to start it. This is a great perk as during early mornings you will be able to enjoy a pre-heated bathroom. Some devices will let you sync the thermostat with the “off” function. Basically, the timer “off” function will always override the thermostat. A fan can be viewed as a separate bathroom device or as an additional accessory to some heaters. Whatever the case, it is very useful in a number of ways but we already cleared that up above. Keep in mind that it will add to the energy expenditure, though. Sorry but design and interface are pretty much the least important thing about a bathroom heater. This is the room which is visited the least and you will hardly spend time looking towards the heater. One drawback is that you will likely see wires if you haven’t opted for an in-wall heater. Other than that, the color or the shape of the body of the gadget isn’t really all that important. If you are picky, though, you can try and look for something that fully complements your bathroom landscape. Having the best bathroom heater nowadays is becoming a necessity and not only an expensive detail to your home. 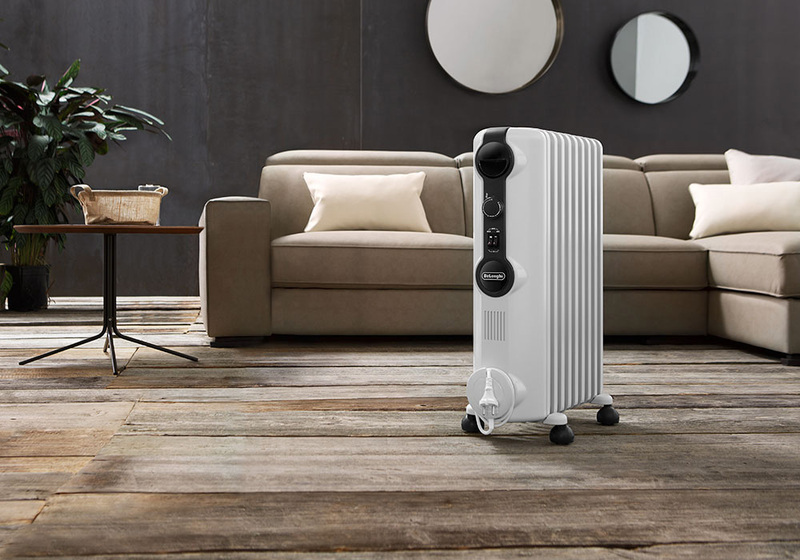 Since we try to be up to date with all trends, we compiled this guide hoping to help you select the heater which would best suit your needs. Our main goal is to be useful to you and your domestic heating endeavors. Let us know if anything was missing from the guide or if anything was not particularly helpful. Feel free to comment on our article and we’d be glad if you shared it. Enjoy your purchases and as always – stay put!